TIGER Woods may be returning this week believing he can kick-start his major-winning career but Colin Montgomerie has cast doubt on the former world No 1’s ability to taste any sort of success ever again. Woods, who hasn’t played since withdrawing in the Farmers Insurance Open in early February, ended a week of speculation on Friday when the 14-times major winner announced he will be playing in the Masters starting on Thursday. Montgomerie is delighted with the decision due to the “buzz” that will come with the four-times Augusta winner’s presence and would dearly love to see Woods back at his best and not the player that has become afflicted with chipping yips. However, the eight-times European No 1, who is here on commentating duties, believes there is genuine doubt about Woods being able to return to any winning enclosure, far less one as high profile as this one. “Hey, never mind a Major, can he win another event ever again?” asked the Scot. “He hasn’t entered Augusta to make up the numbers, I guarantee that. And he will be so determined to contend here and prove to himself more than anyone that he can still do this. Woods has been stuck on 14 majors since winning the 2009 US Open. On the basis of what he’s seen lately, Montgomerie reckons the 39-year-old is not going to get any closer to Jack Nicklaus’s record of 18 major triumphs. Five years ago, Woods also chose the Masters to make his return from a longer lay-off, the one that followed him being in a car crash outside his Florida home which led to revelations about his private life. 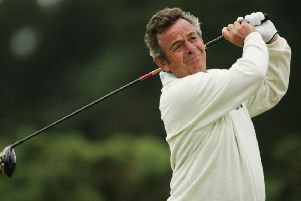 He finished in a tie for fourth in the season’s opening major but failed to set the heather on fire that year and, having had a series of lay-offs since then, mainly due to injury, Montgomerie believes it is getting more difficult to re-ignite his career as each return comes and goes without any tangible evidence of that happening. “Imagine Tiger coming here this week and scoring 68 or 69 – Rory also – on the first day,” he said. “If that happened, the whole place is alive. It would be fantastic. There would be a buzz around the place, the same sort of electricity that we have missed without him. It’s 15 years since the Green Jacket was slipped over the shoulders of a European – Spaniard Jose Maria Olazabal being the last to achieve the feat. In the 20 years prior to that, ten victories were recorded at the Georgia venue split between Olazabal, Seve Ballesteros, Nick Faldo, Bernhard Langer, Ian Woosnam and, of course, Sandy Lyle. “Amazing isn’t it?” noted Montgomerie of the recent drought. “Why is that? Let’s hope it’s just coincidence. Why should it be that we dominated in the late 80s and early 90s, and since then it’s been a dominance by the world as opposed to ourselves? McIlroy, of course, has a date with destiny this week as he bids to become just the sixth player to complete a career grand slam. The 25-year-old is also trying to make it three majors in a row after his impressive victories in quick succession last summer in the Open Championship and US PGA Championship. “Rory’s the favourite, but when you think of Jordan Spieth, Jimmy Walker, Henrik Stenson, Bubba Watson and Dustin Johnson, there’s a lot of good golf behind him,” said Montgomerie. The baton has been taken up in a very positive way by the rest, so there’s a lot of pressure on Rory McIlroy. “Will having some of the limelight taken off him by Tiger playing make it slightly better? He’ll never be under the radar, but perhaps the radar isn’t as high as it might have been. But, at the same time, the moment walks onto the first tee, Rory’s under pressure to achieve.